It is autumn in Kurland St. Mary and the plans for the nuptials of Miss Lucy Harrington, the vicar's daughter, and Major Robert Kurland are proceeding, but not nearly quickly enough for the Major. As Lucy is the niece of an Earl, her highly born London family wants everything to be just so. Both Robert and Lucy want a quiet village wedding but Lucy doesn't want to offend the family. The trouble in the village starts when Robert is called upon to judge the vegetable competition. Lucy warns him that it is a highly political competition, one in which each contestant should be rewarded in some way or peace in the village will be destroyed. Stubbornly, Robert insists on judging solely on merit. The result is that the church verger, Ezekial Thurrock, wins the bulk of the prizes. Sentiment turns ugly quickly but no one knows how ugly until Lucy finds Thurrock dead in the church, his head crushed by a stone gargoyle. His death is ruled an accident, but Lucy is not so sure. As she and Robert investigate, they turn up dark secrets that Lucy is unaware of even though she has lived in Kurland St. Mary all her life. More murder and suggestions of witchcraft place Lucy and Robert in real danger. 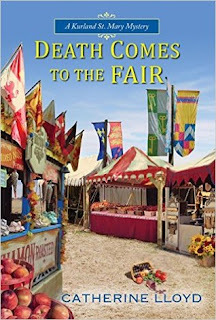 Death Comes to the Fair is the fourth book in this highly enjoyable cozy mystery series. I recommend it for its excellent plotting and period setting. The characters have been well developed throughout. I particularly enjoy the fact that Robert is finally learning to listen to Lucy and granting her freedom that the average man of the period would not. Thanks to Kensington Books and NetGalley for an advance digital copy in return for an honest review.